Central Industrial Security Force deployed in Goa Shipyard Limited organized a blood donation camp in the Shipyard Premises on 09.06.2017. The event was inaugurated at the hands of the Chairman and Managing Director, RAdm Shekhar Mital NM,IN (Retd.). The blood donation camp was organized in collaboration with Goa Medical College, Bambolim. 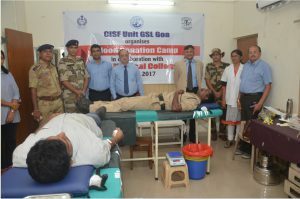 All together 25 CISF personnel from GSL and MPT donated blood to meet the daily needs of the patients admitted in the GMC. CISF has been contributing towards this cause every year and also rises to the occasion whenever the need arises at short notice. The inauguration of the event was attended by Cmde B.B. Nagpal, Director (CPP&BD), Dr. G.V. Prabhu, Consultant Medical, Dr. Clare D’Mello, Goa Medical College, Dy. Cmdt. Bikram and other dignitaries from Goa Shipyard Limited and MPT.